I cut the stems a little shorter for these pretty flowers from the Helpiing Me Grow set to fit nicely within the "frame" of this card. The cool technique I was introducing in this project involve the four photo corners, and I wanted these flowers to be the stars. These little paper photo corners are adorable and so easy to do! 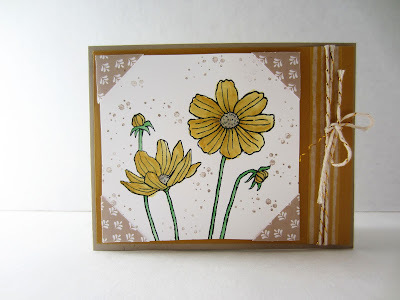 Following is a tutorial on how to make your own version of this card. Fold a 4 1/4" x 11" piece of Crumb Cake cardstock in half, creasing it well with a bone folder. 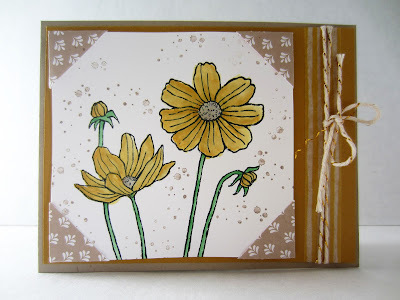 In Memento Tuxedo Black ink, stamp the flowers onto a 3 3/4" x 4" piece of Whisper White cardstock, letting the bottoms of the stems run off the page. Squish some ink into the covers of the Tip Top Taupe, Delightful Dijon and Cucumber Crush ink pads, and use the Aqua Painter with this ink to color in the flowers as desired. 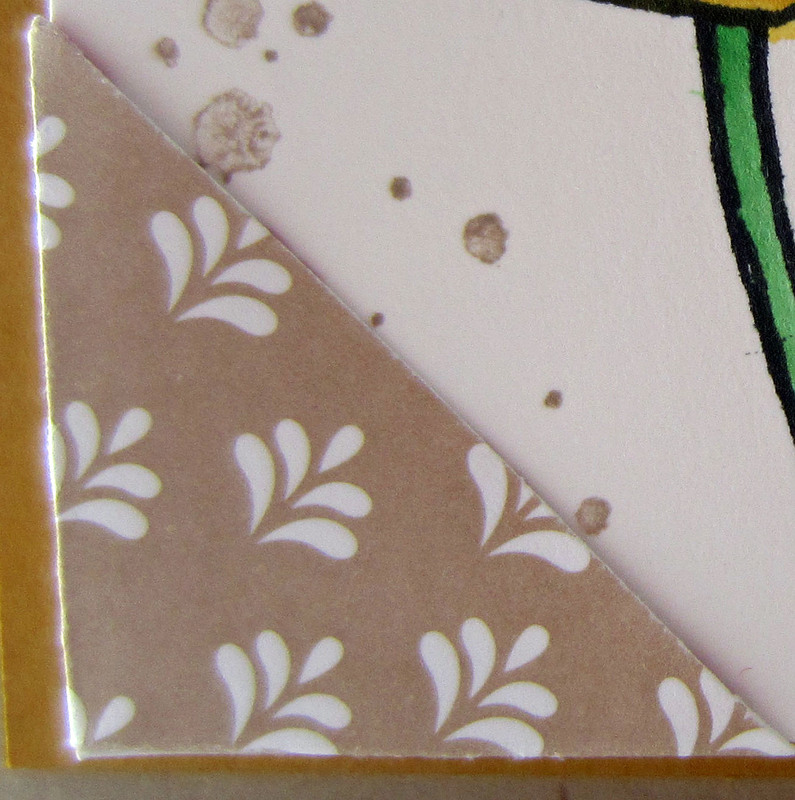 Stamp the little splotches around the flowers with Crumb Cake ink, stamping off first. You don't want these spots too dark! About 1/4" from the right edge of a 4" x 5 1/4" piece of Delightful Dijon cardstock, stretch a piece of the striped Washi Tape, tucking the ends neatly to the back on the two edges. Wrap a piece of metallic baker's twine around this piece twice, ending with a bow. Trim the ends of the twine as desired. Adhere the gold piece to your card base. With a Stampin' Dimensional in each of the four corners and one in the center, add your flower piece, leaving even borders on the top, bottom and left side. This card can be used for virtually ANY occasion. Don't you LOVE that?? Oh those are so sweet and cute! And I also wanted to mention that the Wednesday "To Grandma's House We Go" link party just started over at grandmashousediy.com and I thought you might be interested in joining it, thanks! The corners are very nice. The way they are placed helps us to focus even more on the pretty yellow flowers in the center. Such a pretty card! Love the touch of the corners. Thank you for sharing your creativity at #FridayFrivolity!